Abe and Dianne Bernstein, and Bob Woodward. 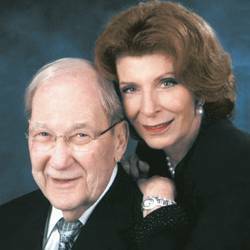 PALM BEACH, FL – Barbara and Jack Kay were honored by the Palm Beach Friends of Magen David Adom at its annual Celebration of Life gala at The Mar-a-Lago Club. 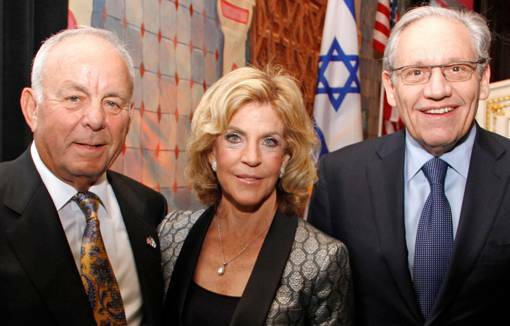 More than 400 supporters attended the event, which raised $2 million for Israel’s National Blood Services Center. Additional plans were discussed to fund a new facility capable of strengthening the existing center, which needs upgrades. “People can make a difference and your presence warms my heart and gives me hope,” Barbara Kay told guests. Isabella Katzenberg, who was once an intern with Magen David Adom and is one of the Kays’ 21 grandchildren, presented the Humanitarian Award to her grandparents. Bob Woodward, Pulitzer Prize-winning journalist, author, and associate editor of The Washington Post, gave the keynote speech about U.S. leadership and U.S. national interests at the Feb. 10, 2013, program. Dianne and Abe Bernstein, and Robin and Bob Berman chaired the gala. Sanford Baklor and Arlene Kaufman were honorary chairs. MDA is Israel’s national emergency-response service, providing medical, ambulance and blood services to its 7.8 million people. MDA also manages Israel’s national blood center, a facility in need of structural upgrades to cope with the threat of attack as well as the country’s growing population. For more information, call (561) 835-0510 or visit www.afmda.org. Photos by Corby Kaye’s Studio Palm Beach.